I forgot to mention that my dearest friend H.W. has helped my family and I start a tradition for Christmas. The question hasn’t come up yet since our kids are too small. But one day the question could come up depending on what type of home we live in at the time. Currently we live in house with no chimney. So the question that the kids would ask is “How does Santa get in to bring us presents?” H.W. sent us (the kids) some gifts and one was to be opened before Christmas. So Isabelle opened the gift to find a box that held a key. It’s called “Santa’s Key”. And on Christmas Eve the children put the key on the doorknob outside for Santa so that he can get in. So we had Isabelle do just that before she went to bed. We hope it’s a nice little tradition we can keep going for the kids. So I’d just like to send a big thanks out to H.W. for helping us start a family tradition! I am not normally a caffeine drinker, yes it’s in pops and such, but I mean more coffee’s and such. I have become a total slave to Starbucks. I blame/thank L.W. for the gift card I got for my birthday. The niffty thing with their gift cards was that if you registered your card, you got a free drink for your birthday and I was just in time. I find myself creating reasons to go out just so I can happen upon a Starbucks. Tonight I have to run out and I know I’ll be stopping at Starbucks. I need all the help I can get. We have to pack up the kids and the dogs and be ready to try to leave on time tomorrow for a trip to the in laws. Ian managed to work out some time off so we can head up for New Years. It will be nice to see them again and the twins have changed quite a bit I think. Isabelle has too but the change isn’t as big I don’t think. Changes. Madeline: her two top teeth have broken though the gums, one is further down than the other so she looks pretty cute/goofy when she smiles really big. She is standing up! She figured this out in less than a day, she was determined to be on two feet and I think she is even more determined to walk. She’s “talking” quite a bit. She plays with her sister when big sister lets her play with her. She follows Isabelle around like crazy which Isabelle so far seems to get a kick out of. She eats most things that you give her. She’s still on baby foods and cereals for the most part. She’s tried yogurt and cheerios. I’m sure she’s put other foods in her mouth that Isabelle has “dropped” on the floor. 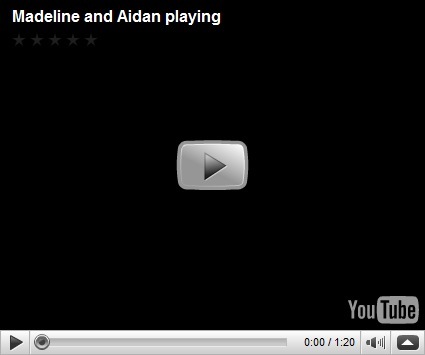 Aidan: We are so proud of our little guy, he has learned to do something that Madeline has not! Don’t get us wrong we are pleased as punch with how Madeline is such a fast learner but it seems that she’s always doing the firsts…first. So we are happy to report that Aidan claps his hands! He was pretty happy with himself when he started doing this. I was happy for him too! He is working really hard on getting around. He is now starting to get up on his knees, and he tries to move but usually falls onto his tummy. He can however move around quite well but pushing with his toes and pulling with his arms and hands. His commando crawl is what I call it. He too eats pretty much anything. Both twins have had some significant pukes after trying just a spoonful of one jar of baby food. I think it was a chicken type thing. They both took one mouthful and gagged followed by a mega-barf. Good times for me. Isabelle is doing really well also. She’s in love with all the new stuff in the house. She especially loves her new kitchen that she got from my parents. However she still loves the toys the twins got also as indicated by her stealing them away from them every chance she gets. Isabelle has an ever growing vocabulary. I am not sure I could even sit here and list out all the things she says. She does really well with her words and we try to encourage her to use them as much as she can. Well I just wanted to put up a quick update. Christmas was good and we had a great time. It was also very tiring for us as well. We are looking forward to our visit this weekend. I get to run around all day today and get things ready as best I can. And whatever we forget we will just have to buy again! Yep, it’s one of those days again. I don’t know what started it, perhaps the stiff back and shoulders, the dull drab weather outside, all three kids screaming at once, stubbing my foot, exhaustion….. I have no idea, but whatever the cause I would like it to go away now. I’m also just about to bang my head against the wall if I can’t get this project I’m working on to actually work!! It’s my own fault for starting it so late, but I really don’t have a lot of spare time and sometimes when I do I’m sleeping. Plus this project usually comes second to housework and other chores. I hope to figure it out in the next few days. Well my tree is up, Ian put lights up outside the other night. I no longer feel like we are the house that Christmas forgot on our block. The gifts are all wrapped. There is one left that needs a bit of assembly so Santa dropped that one off early. I hope to get to that tonight and get it done so I am completely ready to start cleaning up my house for Christmas Day. My mom has graciously offered to bring and cook Christmas dinner here at our house. We are also having a few people over during the day that Ian works with. So it’s going to be a busy little spot. I wish we were just tidier people. I know that the kids toys will one day be less but there is all our junk that has to be accounted for. I wish I was better at keeping everything in a home. And I’d really love to stop leaving things laying around. I found our breakfast bar a month ago and once again it’s lost again. I have half a mind to buy bar stools so that we actually use the darn thing and therefore can’t use it as a junk collector. Either that or I’m going to put my fish tank there and then we for sure can’t leave stuff laying around. So I thinned out some of the kids toys. Probably do it again once Santa comes. We are going to be able to have one heck of a garage sale this summer. Too bad we aren’t up north because we could make way more on this stuff there than we will here. But oh well. So long as someone can give this stuff a new home. I forgot to mention, we are adults now and actually have dining room chairs!!! Not as many as I wanted but 4 will do!! We also have a few loaners from family, but we’ll be giving those back soon probably. Feels good to finally have real chairs around the table rather than camping chairs! Well back to working on my project. This was a nice little distraction for a bit. I’ve calmed down and can now try to take a fresh approach to it. Where is all the fluffy white stuff?? Send more snow. It’s not too much to ask for. It is December. This is Canada we are supposed to have snow. December is supposed to be white. No more rain. No more warm temps that make the snow turn to slush and then huge puddles. I’m tired of mopping up dirty dog prints. Is mushy. The weather also can’t make up it’s mind. Snow or rain? Pick one mother nature. I would prefer snow myself. In the Arctic, they have had lots of snow for the last 3 months already and here it is December 12th and we finally get snow only to have it get rained on. I dislike this weather. I want the ground to freeze already and I’d also like it to just be covered in nice white snow. I know the ground will freeze, sadly the snow won’t stay white for very long. The kids are nearing the end of their nap time so this is most likely going to be a short post. I had a great birthday. We got home from our little night away in TO and visited with my parents for a bit. We then went out for dinner at Swiss Chalet. Came home and put some tired kids to bed and went to bed ourselves. Our time in TO was brief, but we had a great time. We took Isabelle to the pool our first afternoon there. She was hesitant at first but once in and moving around with us she had a great time. We were prunes after two hours of swimming so it was time to head up for dinner. We were going to try the restaurant at the hotel but it was closed for a private function. That was a bummer but we ended up a pretty tasty joint. We were going to try for an after dinner swim, however because we had to go out for dinner it got us home a bit late and it was getting close to the time for Isabelle to wind down. The three of us hung out in bed watching AFV and then Isabelle went to bed and I followed shortly after. The next day we had some breakfast, went for another swim, drove past the Eaton centre, stopped in at Square 1 and then went home and you know the rest. My tree is finally going to get decorated. I finally remembered to buy the hooks for ornaments. I was going to work on it last night but I went to bed early instead. I should have it ready by the end of the week. Time to get bottles and lunches ready. It seems to have stopped raining which is a good thing. Here is a video of the twins playing, Isabelle also makes a brief appearance. Despite the cold wind, we packed up the kidlets and took them for a walk. My friend Laura and here Mom came by today for a visit and it was wonderful to see them both. Madeline and Aidan we packed into their snowsuits and bundled up in the stroller. Isabelle was in her new winter jacket which were equipped with new mitts from Grandma E. The twins also had new mitts from her also. The dogs really enjoyed the walk, Max could be heard barking most of the way! We took them to the park near our house so they could run around off leash for a little bit before heading home to get out of the cold. The kids are part way through their afternoon nap and so far it’s not going well. It had been going quite well until I took Isabelle up for her nap time and she was being little miss giggles too loud. Then on top of that her puppy was in the twins room. So I had to open the door to their room and luckily puppy was right there but both twins heard the door open and now they are up wondering why I’m not coming in there to get them despite their crying. No. This is a word we are hearing a lot of these days. And it’s coming from a tiny member of our household. Me: Isabelle, let’s go upstairs for naptime. Me: Isabelle could you please give that toy back to Aidan. Me: Isabelle could you please give *insert any object that a child under the age of 2 shouldn’t have in there hands here* that to Mommy. Me: Isabelle, do you need your diaper changed? You get the idea. But our most favourite use of the word is when she says “No no no no no Manny” (Manny= Maddy in Isabelle language) This is the use of “No” we hear the most of since Madeline has started crawling and basically touching everything. Isabelle is trying her best. There are a few things that we are okay with her snatching back from the twins but we are trying to teach her that they can play with the toys also. It will be nice when Christmas comes because Isabelle will get some more toys that are a little more specific for her in age. Right now they are all playing with toys that are just starting to be too young for her but the right age for the twins. I’m slowly getting into Christmas mode. I’m about to start my cards and hopefully they will be ready and done on time this year. I don’t think I’ve done cards in a few years because I just kept putting them off and then it was too late. However this year we are now a little more centrally located so it should be a bit better. I’m off to enjoy a few moments of quiet before I get the kids up and start getting dinner ready. I can’t wait for the weekend to come. It’s the weekend of our little mini trip to TO! It’s going to be fun, Isabelle has already been wearing her bathing suit around the house getting ready for the pool at the hotel!